I bought this jacket for my daughter as a Christmas gift and she absolutely loved it! We were both impressed with the style and quality of the leather. Nice features and pockets. Very chic, yet functional and it fit her perfectly. The sleeves length was just right. 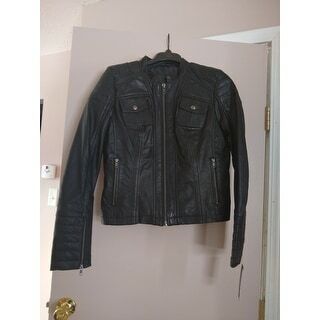 I would definitely recommend this jacket to those looking for a stylish yet functional leather jacket. Look tough in this timeless scuba collar jacket. Made from lambskin leather with a quilted shoulder detail, double stitching, and two chest patch pockets and hand pockets, this jacket is classic yet contemporary. This jacket runs a little small and long in the arms, which was perfect for me. I'm 5'10 125 lbs and I was able to order the small and it is almost long enough in the arms. Since usually nothing that fits is long enough, I was impressed. I'd say size small is a size 2 vs a 4, so adjust accordingly. Soft leather, very well-made, and it came out of the bag ready to wear. Favorite leather jacket ever! Great for cool to cold but not really cold temps. This jacket is perfect for me! I'm 5'5" & 119 lbs, so I got a medium based on a few other reviews and the sizing information provided. It's just right. The sleeves are a little long, but everything else fits perfectly. It has 2 internal chest pockets as well as the ones you see outside. I love the vertical zippered pockets for your hands. It's all very soft lambskin leather, and the cognac color is awesome with my golden blonde hair. Looks nice. Feels nice. Sleeves are a good long length. I'm usually a S or XS, and the Small works well for me. It's a little tight across the shoulders and a little big in the chest. The outside pockets have zippers, which I'm not crazy about, but you can still gets your hands in easily. Also has 2 pockets inside. Seems well made. Front zipper works easily. Smells fine. I'm glad I got it. I really like this jacket. Soft, comfortable, and I get lots of compliments when wearing it. I took people's advice and got 1 size higher than usual. It was good advice. Sleeves are a bit long, but I unzip the sleeves and it still looks good. 4 stars for long sleeves, otherwise it would have been 5. This jacket is fabulous. I love the zippers. It I true black and fits great. I love having a new leather jacket for the upcoming winter season. Your shipping is great. I never have to wait long before my items arrive. Thanks! This is a nice quality jacket and arrived quickly. Runs VERY small - I was surprised my M fit when I took it out of the box. I would normally order a small in a jacket but reviews said order up and I did. I’d be happier with a L but it’s out of stock. 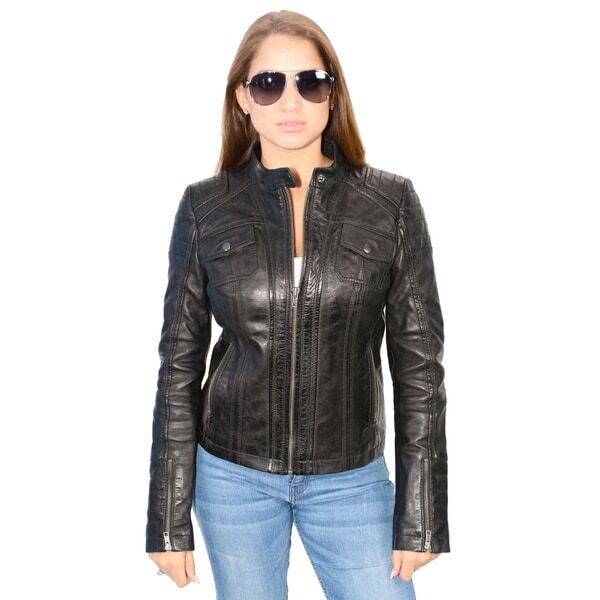 This jacket is made out of a soft leather and the cut is very attractive. Can’t beat it for the price. Bought this in a small for a friend who is 5”1 and 120 lbs. Fit nicely. Beautiful coat very soft leather. I usually need a small in jackets and tops purchased the medium after reading reviews. Jacket is snug around the chest area glad I sized up. Love coat love Overstock!. Nice soft leather jacket. It doesn't look as good on me as it does on the model in the picture but I'll keep it. I ordered a medium only because I have broad shoulders. It's a decent jacket but it's always good to have more than one. I am very pleased with my itder. Fits trye to size. Very nice quality, and condition of the Jacket. I am very pleased with my purchase. It was delivered by quickly also! Great item. My wife loved the jacket. It arrived on-time and in great condition! Awesome jacket. Stylish and great price. This is a really cool jacket. It is lightweight and fits me like a glove. I was very pleasantly surprised by the quality considering the low price. "Where is there a size chart for this jacket? Would love a little more info." "what is the length of this jacket (size small) from the back of the collar to the bottom of the center back?" Hello kitsandpups, thank you for your inquiry. Unfortunately, the information you have requested is currently unavailable. You will receive an email notification once an answer is posted. Have a great day.